Experience an amazing 3D space battle on your phone or tablet with our Live Space Battle Wallpaper. 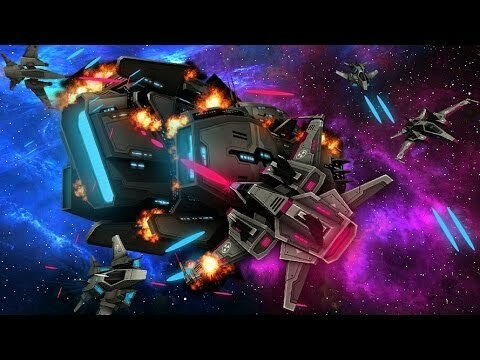 The mother ship is under attack and only our brave hero’s can help it! Lots of lasers and explosions ensue! •Hero camera: follow our hero in the chase of the villains that attack our mother ship. Fight and defend! •Attacker camera: you rather to be the anti-hero? then this is your point of view. •Panoramic camera: the big picture, from here you can see the whole action and how the mother ship takes heat from all sides. Ready to run on phones and tablets. Optimized as spectacular, It loads fast and run smooth while moving more than 20 space ships at the same time! You’ll never see so much action in a live wallpaper. This is a wallpaper (not a game) so you won’t find the icon like the usual app. you need to access to the wallpapers menu and look for the skull wallpaper in the LIVE wallpapers section. •Hit the phone menu key and and select wallpapers. •Keep pressed the screen and wait for a menu with the options to pop. Click Here To Visit Google Play! •CAMERA: Watch the action from different angles: Classic, Action and First Person, as if you were the ragdoll! •OBSTACLES: You can choose to have just pegs, pegs and bombs or just bombs, that explode! •COLOR STYLES: 5 to choose from: Classic, Black and White, Rainbow, Darkness and Sepia. Rainbow will softly loop through all the rainbow colors fading one after the other. •SPEED: Play in normal speed, very fast or in slow motion, and watch the ragdoll hit things in bullet time. •CONTROL: You can turn Off the tilt controls and let the ragdoll just fall on its own, or turn tilt On and have a say over its fate. Accessing the Settings. Once you set the Live Wallpaper, to back to the settings screen just double tap the screen. Note: this is a Wallpaper. Once you install it don’t look for an app icon, but rather open your device’s Wallpaper menu and look for “Ragdoll Live Wallpaper” in there.